We’d love your help. 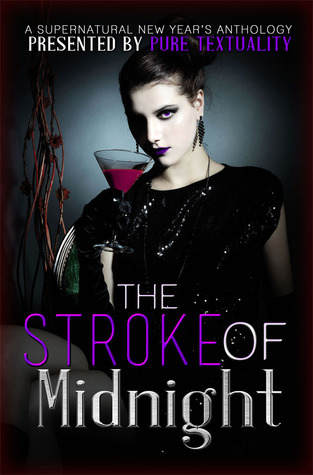 Let us know what’s wrong with this preview of The Stroke of Midnight by Jena Gregoire. THIS ANTHOLOGY IS NO LONGER AVAILABLE. It's New Year's Eve and the supernatural community is ringing in the New Year with style! Fourteen of your favorite authors have come together to bring you The Stroke of Midnight: A Supernatural New Year's Anthology! The Stroke of Midnight features fourteen urban fantasy/paranormal short stories. Celebrate the turn of the year with all THIS ANTHOLOGY IS NO LONGER AVAILABLE. To ask other readers questions about The Stroke of Midnight, please sign up. The first I knew of this book was when I saw a Facebook post by Author J M Gregoire, in the All Hallows Eve Indies Blog Tour group. The post said it was a free eBook featuring 14 authors- bestsellers and debuts, and that bloggers who review are entered into a giveaway to win a $25.00 gift card for an eBook retailer of choice. So, naturally as any book blogger who loves supernatural would; I downloaded the book. I must admit that I had only ever heard of two of the authors included; J M Gregoire a The first I knew of this book was when I saw a Facebook post by Author J M Gregoire, in the All Hallows Eve Indies Blog Tour group. The post said it was a free eBook featuring 14 authors- bestsellers and debuts, and that bloggers who review are entered into a giveaway to win a $25.00 gift card for an eBook retailer of choice. So, naturally as any book blogger who loves supernatural would; I downloaded the book. I must admit that I had only ever heard of two of the authors included; J M Gregoire and Brandy Dorsch. These two authors I only met earlier this year when I participated in the All Hallows Eve Indie Blog Tour. That said this collection of 14 authors was a great way to be introduced to new authors and get a taste of their work. I loved this anthology so much so that even though I had spent 8 hours as work I still managed to read this eBook within 24 hours of downloading it. I was hooked from the start. The collection features humans, werewolves, ghosts, witches, magic and my personal favourite Vampires! I knew some of the characters but I also met sooo many new and intriguing characters. I loved being able to read new; well new to me; work by authors that I’ve never encountered before. It’s certainly given me food for thought when it comes time for me to buy myself some new eBooks. My overall opinion on this book is good. The authors are all good and have their own writing style. They all do a great job of capturing and keeping the reader’s attention. As well as showing some character development even in these short stories. I had the pleasure of reviewing the anthology, The Stroke of Midnight, from Pure Textuality as part of the blog tour. As with any anthology the stories are short and at times, the stories can leave the reader wanting more or in some instances, confused. I'm rating my experience with this anthology a 4 star. Some of the stories were AMAZING and they left me wanting MORE. Other stories I felt myself skim over. I think if they were expanded upon further, rather than as a short story, it would haven I had the pleasure of reviewing the anthology, The Stroke of Midnight, from Pure Textuality as part of the blog tour. As with any anthology the stories are short and at times, the stories can leave the reader wanting more or in some instances, confused. I'm rating my experience with this anthology a 4 star. Some of the stories were AMAZING and they left me wanting MORE. Other stories I felt myself skim over. I think if they were expanded upon further, rather than as a short story, it would haven given it more life. Personally I was drawn into a few of the stories and absolutely wanted more!!! I absolutely look forward to more anthologies produced from Pure Textuality! Well done ladies!! I read Susan Illene's "Tempting The Moon" in this book. It was a great quick little read with Melena and her friends. If you're reading The Sensor Series this is a must-read! Even though I took part in this book, I was so excited to read stories from some amazing talent. These short stories take you into the hearts and minds of these writers. There were a few that I was familiar with and a few new authors that I am excited to delve into. Take a chance and discover the world of paranormal. very good stories. Some kept you hanging on making you wish there was more and then there was some stories that had a very good ending but all in all it was a good book to read and each story was well written. Each Author has done a good job on this book. Some stories were good...some were great...I actually ditched a couple within a few paragraphs. But overall, it was an ok anthology. Excellent anthology full of various paranormal characters, written by creative authors! Thoroughly enjoyed! Bestselling author Jena Gregoire was born and raised in New Hampshire, USA, and despite her abhorrence for any season which dares to drop to a temperature below seventy degrees, she still currently resides there with her two children and several furbabies. Always a passionate reader, her love of urban fantasy books inevitably morphed into a love of writing them. She is currently working on the Hel Bestselling author Jena Gregoire was born and raised in New Hampshire, USA, and despite her abhorrence for any season which dares to drop to a temperature below seventy degrees, she still currently resides there with her two children and several furbabies. Always a passionate reader, her love of urban fantasy books inevitably morphed into a love of writing them. She is currently working on the Hellfire (previously known as Demon Legacy) series and has a Hellfire spinoff series coming soon. Jena Gregoire previously published as J.M. Gregoire.